Join our eagle-eyed heroine Robyn on her search for justice and riches as she attempts to win back the village that is rightfully hers. This 5 reel mystical slot adventure is completely encapsulating, turn the fairy tale symbols to win big across 243 differing paylines. Genesis Gaming provides video slot content to the global leaders of the gaming industry. The development team is very creative and brings together experience, innovation and technology to ensure every game delivered offers a lot of entertainment to their players. The company was founded in 2008 and their repertoire contains over 200 different titles, offering a diversity of themes to choose from. Genesis Gaming has a great reputation and deliver outstanding gaming performance. Robyn might remind you a little of Robin Hood as their stories share some similarities. She lives deep in the woods and is an expert with the bow and arrows. Robyn´s village was plundered by the evil harlequin queen and the beautiful young girl strives to win back her property. The reels are somewhat floating in the middle of the screen and in the background you can see a misty forest. To the sides of the reels are some medieval banners adding to the atmosphere of this game. On the five reels and three rows you will encounter Robyn herself, her horse, a good-looking prince and harlequin queen. There are also the usual playing cards symbols A, Q, K, J, and 10 to complete the set of symbols on the reels. To create winning combinations you have to land matching symbols in adjacent reels from left to right, which forms a massive 243 ways to make winning combos. The wild in this game is represented by a simple green wild logo and will substitute every other symbol except for the scatter. However there is an exciting target symbol on the reels which leads to a great random feature. Whenever you land one or more of the target symbols on the reels Robyn will show up in the bottom right of the screen and start firing arrows to the targets. The target symbols will now turn into random symbols to increase chances of bigger wins. All targets will then turn into the same reel to help you form winning combinations. 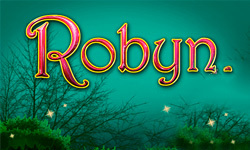 The Robyn logo is the scatter of this game and if you land three or more of it anywhere on the reels in the same spin you are awarded 12 free spins. During the free spins rounds the target symbol is still active but instead of turning into a random symbol it will always turn into a wild symbol you can also re-trigger the feature when landing three or more scatter symbols in a spin again. To be part of this adventure and help Robyn in her fight for her property you have to place a minimum bet of 25 p or up to 25 pounds. Robyn will provide an excellent gameplay experience with creative bonus features such as the random targets. The beautiful aesthetics and the theme related symbols will immerse you into this storyline very quickly. With 243 different ways of creating winning combinations and the exciting bonus features, Robyn may turn your bet into big prizes.